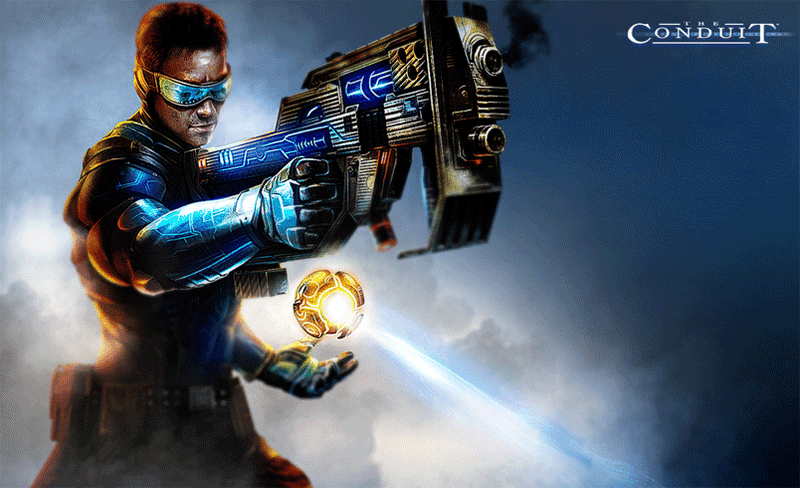 High Voltage an Sega seek to take on the mantle of the Nintendo Wii's signature first-person shooter with The Conduit. Have they succeeded? The Conduit has everything going for it. It's an exclusive first-person shooter for a console that generally only sees second-rate ports. It features a compelling story of conspiracy, betrayal, and alien invasion on the streets of Washington D.C. And it also delivers a robust multiplayer experience on a platform that isn't exactly known for its only capabilities. What could possibly go wrong? Let us channel the assembled game critics through The Conduit and see what comes out the other end. The game's story is your typical alien-filled and shadowy government conspiracy that doesn't really go anywhere. All you really need to know is that the bug-like alien troops come out of glowing portals called conduits. So a lot of the gameplay tasks you with fighting your way up to a conduit, and then shutting it with a grenade. You'll also have to pull out the all-seeing eye, a glowing orb that acts as your primary way to interact with computers and as a beam that reveals hidden objects in the world. Sometimes you'll use this to unlock doors that block your forward progress. Other times, you'll use it to open up secret pathways to additional weaponry, disarm normally invisible mines, and so on. The real draw in The Conduit is the outstanding control scheme. Conceptually, it's nothing special. You aim your gun with the remote, walk around with the analog stick, and perform various moves by hitting buttons or performing specific motions. However, the execution is nearly flawless. You can aim with pinpoint precision, easily lining up headshots from across the screen or spinning around to cut down a critter creeping up behind you. With more than 10 different actions to keep track of, it can be difficult to find the ideal controller setup, but you can customize the controls to suit your play style. Online play works better than I expected on the Wii, which is to say that it's slightly better than what PC gamers had circa 1998. Matchmaking works well enough, and latency issues are present but not catastrophic. An interesting take on free-for-all deathmatching, dubbed Bounty Hunter mode, subtly changes the game by only scoring points for players who have wronged you in the past, giving you an onscreen objective arrow to the current location of your most bitter foe. Beyond that, the old standbys like capture-the-flag and team deathmatch round out a capable online experience. High Voltage has done a fantastic job showing what is possible with the Wii when a developer actually commits itself to the console. Sadly, the answer isn't as much as you'd hope. Claims that the graphics would reach that of early Xbox 360 titles was a bit of an overstatement, and the game is likely outperformed in some areas by a number of last-generation titles. Some enemy character models look fantastic, and nearly reach Xbox 360 levels, but others look downright muddy. It has that same "next-gen shine" that Perfect Dark: Zero took advantage of, but environments can often look rough. For a Wii game, it's likely one of the best looking, but saying much more is really stretching the truth. This is the paradox of The Conduit. Its disappointing single-player component seems hastily-designed with its cookie-cutter plot, limited range of enemies, and myriad elements copied wholesale from popular recent first-person shooters. On the other hand, its multiplayer component is great, matching online shooters on other platforms feature-for-feature and providing a no-hassle experience that's among the best on Wii. Hopefully High Voltage will learn from The Conduit's shortcomings for their next game, but for now, Wii owners will have to settle for something very good instead of truly great. Nice to see everyone agrees.